These Farm Heroes level 540 cheats and tips will help you beat level 540 of Farm Heroes. 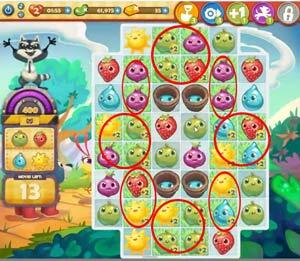 The objective of Farm Heroes level 540 is to defeat Rancid the Racoon with apples, strawberries, waterdroplets and suns in 13 moves. Rancid is really tough to beat, and on this level you only have 12 moves to beat him! 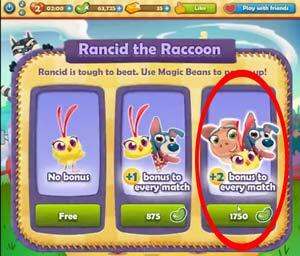 Before the level starts, buy 1750 magic beans to give your cropsies a +2 bonus on every match. Otherwise, rancid is going to be really difficult to beat! You want to make matches on the grass, so that you can get the big bonus points. This shouldn’t be that difficult a tip to follow. Raindrops are one of the crops you need to beat Rancid, but there aren’t that many of them on the board. Knock over the water buckets to make more rain drops! That being said, make sure you don’t flood the board. You need to make matches with other cropsies too. Spill the buckets by making three matches next to them. the buckets will refill after they’ve been spilled.